Caption slip reads: "Photographer: Emery. Date: 1957-11-01. Reporter: attn city desk. Assignment: litterbugs page for Monday. Special Instructions: for Monday. 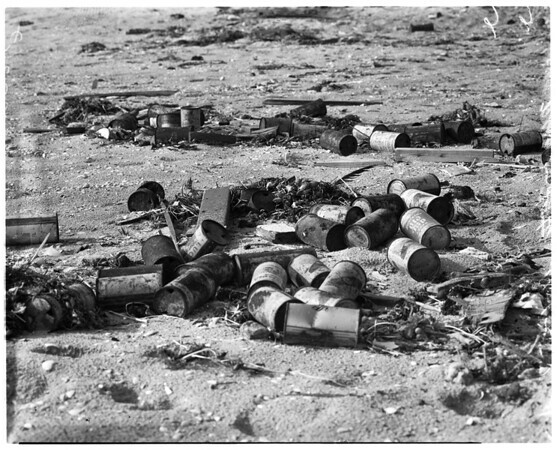 66-67-20-21-56-57: At 'Tin Can Beach' Orange County's 3-mile beach playground between Sunset Beach and Huntington Beach, summer's litterbugs have left annual 30 tons of empty cans, bottles, food cartons, paper plates, steak bones, corn cobs and old shoes. Photos show rusty 'path to the sea' through junk".